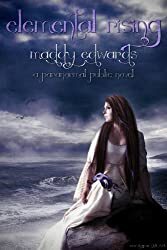 Elemental Rising is book two of the Paranormal Public series by Maddy Edwards and follows Charlotte and her gang into the second half of freshman year. Charlotte is back at school, but things are changing. The demons are everywhere, and she knows they’re after her. She has Tactical training, which is really just an excuse to let people fight with her. And, just to make things worse, there’s now an unexplained sickness infecting the vampires. With no one believing them, its up to Charlotte, Lisabelle, and Sip are all that’s left to go hunting for the real culprit. If they’re not killed first.